Total grade of CO2 extracts - these are extracts manufactured by using only CO2 as solvent... they contain the essential oil from the plant been processed + plant waxes. These are solid waxy products at room temperaure and are soluble in carrier oils... A water bath at 50 cebtigrades will liquify them and make them suitable for inclusion in skin care and cosmetic formulations. Select grade of CO2 extracts - in most of the cases these are extracts which have been made by adding organic ethanol as co-solvent during the extraction of the raw materials. The CO2 extracts made this way contain the volatile components /essential oils/ and are water and/or ethanol soluble. 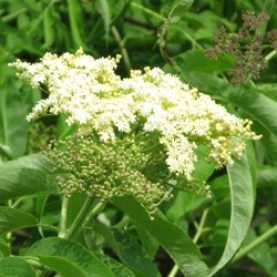 Lets say "food grade" and could be used as flavors... An example is utilization of Linden and Elderflower CO2 selective extracts in production of yogurt, for flavoring of mineral waters etc. This particular extract is Total grade.